Islamic art has always had a relation with complex mathematical patterns. Now two researchers have found that some of these patterns from medieval times reflect mathematical relations discovered by mathematician Roger Penrose in the 1970's. One the interesting features of the pattern is that it appears regular, but never repeats itself. 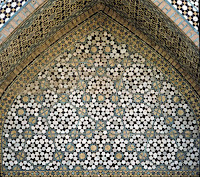 Islamic tiling patterns were put together not with a compass and ruler, as previously assumed, but by tessellating a small number of different tiles with complex shapes, say Peter J. Lu of Harvard University in Cambridge, Massachusetts and Paul Steinhardt of Princeton University in New Jersey. The researchers think that this technique was developed around the start of the thirteenth century. By the fifteenth century, it was sophisticated enough to make complex patterns now described as quasi-periodic. The conventional view holds that girih (geometric star-and-polygon, or strapwork) patterns in medieval Islamic architecture were conceived by their designers as a network of zigzagging lines, where the lines were drafted directly with a straightedge and a compass. We show that by 1200 C.E. a conceptual breakthrough occurred in which girih patterns were reconceived as tessellations of a special set of equilateral polygons ("girih tiles") decorated with lines. These tiles enabled the creation of increasingly complex periodic girih patterns, and by the 15th century, the tessellation approach was combined with self-similar transformations to construct nearly perfect quasi-crystalline Penrose patterns,five centuries before their discovery in the West. It appears that the artisans didn't know the mathematical theory behind their creation, but they indeed had an intuitive sense regarding the design. It reminds me of the mathematical analysis of Jackson Pollock's work, which shows that he was working with fractal patterns before the actual development of the fractal theory. Both the tile works and Pollack's paintings are amazing even without any mathematical theories...but this just adds some extra oomph! The parents of 24,000 children in northern Pakistan refused to allow health workers to administer polio vaccinations last month, mostly due to rumours that the harmless vaccine was an American plot to sterilise innocent Muslim children. The disinformation - spread by extremist clerics using mosque loudspeakers and illegal radio stations, and by word of mouth - has caused a sharp jump in polio cases in Pakistan and hit global efforts to eradicate the debilitating disease. The World Health Organisation (WHO) recorded 39 cases of polio in Pakistan in 2006, up from 28 in 2005. The disease is concentrated in North-West Frontier Province, where 60% of the refusals were attributed to "religious reasons". The North-West Frontier Province government made strenuous efforts to counter talk of an "infidel vaccine". Health workers fanning across the province last month were equipped with copies of a fatwa, or religious order, endorsing the vaccinations and signed by Maulana Fazlur Rehman and Qazi Hussain Ahmed, the leaders of Pakistan's most powerful religious parties. The move reassured many doubters. More than 5.7 million children were vaccinated in January, with another 3 million targeted in a second round due to start next Tuesday. Science Times had a nice article (A Familiar and Prescient Voice, Brought to Life) yesterday on Carl Sagan and his book, The Varieties of Scientific Experience: A Personal View of the Search for God. Now, however, Dr. Sagan has rejoined the cosmic debate from the grave. The occasion is the publication last month of “The Varieties of Scientific Experience: A Personal View of the Search for God” (Penguin). The book is based on a series of lectures exploring the boundary between science and religion that Dr. Sagan gave in Glasgow in 1985, and it was edited by Ann Druyan, his widow and collaborator. While there have been many books on the topic of science & religion recently, the one thing that stands out about Sagan is his tone that nicely balances a respect for believers with his skeptical approach to religion. Sagan does not deny the existence of God. Nor does he affirm it. As he quips in the lively Q&A section appended to the lectures, "Absence of evidence is not evidence of absence." What Sagan does do is insist on the primacy of scientific method and scientific evidence, and he holds the many and various "proofs" of God's existence up to these scientific standards. Most are found wanting. But Sagan is not harsh in his critiques of religious thought; he is more perplexed by theology's narrow and unimaginative vision. "I did not evolve from Turkana Boy or anything like it," says Bishop Boniface Adoyo, head of Kenya's 35 evangelical denominations, which he claims have 10 million followers. "These sorts of silly views are killing our faith." He's calling on his flock to boycott the exhibition and has demanded the museum relegate the fossil collection to a back room -- along with some kind of notice saying evolution is not a fact but merely one of a number of theories. "Whether the bishop likes it or not, Turkana Boy is a distant relation of his," Leakey, who founded the museum's prehistory department, told The Associated Press. "The bishop is descended from the apes and these fossils tell how he evolved." Its like a family feud. Well like it or not, you belong to this family - and you can't choose to opt out of it. The positive thing here is that Bishop Adoyo's evangelical coalition, which also believes in a 12,000 year old Earth, is the only religious group concerned about the exhibit. Hope it stays that way. Several new books have come out on the topic of origin of religious beliefs in the past few months. The latest is by an anthropologist, Barbara King, and its called Evolving God: A Provocative View on the Origins of Religion. Her theory is based on the studies of social behaviour of apes and monkeys. Here is a long Salon.com interview with Barbara King. Take Daniel Dannett, the philosopher who has proposed that religion is a meme -- an idea that evolved like a virus -- that infected our ancestors and continued to spread throughout cultures. By contrast, anthropologist Pascal Boyer argues that religious belief is a quirky byproduct of a brain that evolved to detect predators and other survival needs. In this view, the brain developed a hair-trigger detection system to believe the world is full of "agents" that affect our lives. And British biologist Lewis Wolpert, with yet another theory, posits that religion developed once hominids understood cause and effect, which allowed them to make complex tools. Once they started to make causal connections, they felt compelled to explain life's mysteries. Their brains, in essence, turned into "belief engines." For the last two decades, King has studied ape and monkey behavior in Gabon and Kenya, and at the Smithsonian's National Zoo. In her new book, "Evolving God: A Provocative View on the Origins of Religion," King argues that religion is rooted in our social and emotional connections with each other. What's more, we can trace back the origins of our religious impulse not just to early cave paintings and burial sites 20,000 to 40,000 years ago, but much earlier -- back to our ancient ancestors millions of years ago. And today, King says, we can see the foundations of religious behavior in chimpanzees and gorillas; watching our distant cousins can do much to explain the foundations of our own beliefs. I'm part of the camp of people who thinks it's perfectly possible to see religion and science as compatible areas of thought and inquiry. In my book, I lay out three choices. You can say you've got to choose one. You can believe in science or you can have faith in God -- the Richard Dawkins school of thought. Or you can say there are "non-overlapping magisteria" -- the famous Stephen Jay Gould answer that religion will help us with meaning, and science will tell us about other things. I'm actually in a third place. If you can avoid being a biblical literalist, and if you can avoid being an arrogant scientist who tells everyone else what to think, you can think on multiple levels at once. There's a lot of beauty in seeing that religion and science are really about the same things. They can be perfectly compatible. She describes herself as spiritual - which is quite a vague category. Her view on the compatibility of science & religion is equally vague. Of course, they can be compatible if you consider the feeling of awe provided by science as a religious experience - and that is indeed a good way of thinking about religion and science. But I'm not sure if this is what she is saying. Otherwise, its quite hard to make science & religion compatible/tolerable without resorting to Gould's non-overlapping magestaria (which has its own problems). Just to add variety to evolution/creationism debates, we have Turkish author Harun Yahya (this is his pen-name) who has made Islamic Creationism quite popular in the Islamic world. He has a very slick website, documentaries, and a collection of over 100 books attributed to him (yes, and most of these were written in the last 2-3 years). Now his latest book, Atlas of Creation (770 pages), has been sent to tens of thousands of French schools and universities. Its not clear who is funding this campaign, but Harun Yahya's group appears to be doing quite well. Apart from the usual creationist diatribe against evolution, it describes Darwin's theory of evolution as the "true source of terrorism". 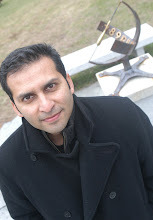 The book features a photograph of the September 11, 2001 attacks on the World Trade Center with the caption: "Those who perpetuate terror in the world are in fact Darwinists. Darwinism is the only philosophy that values and incites conflict." Here is the news article regarding this. This book will provide you with not only such information as what fossils are and where and how they are found, but also a closer examination of a variety of fossil specimens, millions of years old, that are still able to declare, "We never underwent evolution; we were created." The fossils discussed and illustrated in this book are just a few examples of the hundreds of millions of specimens that prove the fact of creation. And even these few are enough to prove that the theory of evolution is a major hoax and deception in the history of science.